Opor is a typical Javanese dish which will be served during Lebaran or end of Ramadhan festive days. This menu will be eaten usually with Ketupat ( A compressed rice which made from rice that has been wrapped in a woven palm leaf pouch then boiled). For those who can't stand hot and spicy dishes, opor is maybe the best choice ;-). 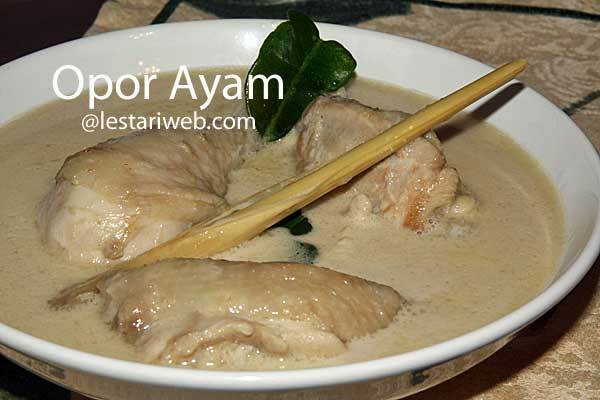 There are two ways to prepare Opor Ayam. First version is to cook the chicken together with the spices and coconut milk until the chicken well cooked and the sauce becomes thick. Here you can save the cooking time. The second version is to fry the chicken until slighly coloured / half cooked then add them into the boiled coconut milk and continue cooking until the chicken well cooked. 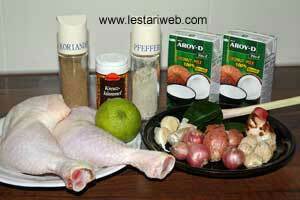 Cut each chicken thigh into 3 pieces and rub them all over with lemon juice & 1/2 tsp of salt. Keep aside for 15 minutes. Heat 5 tbsp oil in a frying pan and fry the chicken until half cooked or the chicken slighly coloured. Put aside. Put all the ingredients for the paste into a blender and blend until smooth. Add a little bit oil if necessary. Heat 2 tbsp used oil in a wok or saucepan. (Don't add oil if already added during a blending process). Stir fry the paste until fragrant. Add the lemon grass and kaffir-lime leaf. Pour in the coconut milk and bring to boil on medium heat. Stir occationally. Adjust the seasoning, add the salt and pepper to taste. Add the chicken peaces, bring to boil again then simmer until the chicken well cooked and the coconut milk becomes thick.